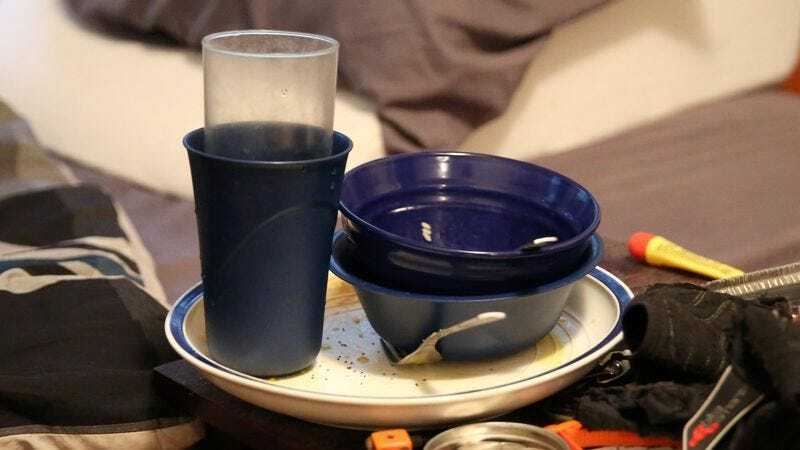 CARSON CITY, MI—Nearly a week after the dishes vanished from the kitchen cabinets, authorities reported Wednesday that a collection of missing plates and glasses were found filthy but safe in roommate Brian Massoud’s room. “We are pleased to announce that the three missing plates and five glasses were located on the floor next to Brian’s bed, absolutely disgusting but now, thankfully, out of harm’s way,” said Michael Sanders, who had led the exhaustive search of the three-bedroom apartment that had seemed hopeless until a tip from Massoud’s girlfriend directed authorities to a dinner plate crusted with melted cheese and a tumbler with fingernail clippings floating in an inch of rapidly spoiling milk. “Unsurprisingly, given what they’ve been through, it will take some time before these dishes will be able to handle any contact with food or drink. But with the proper rehabilitation, we are optimistic that they can be reshelved and resume a normal life.” At press time, the dishes had all been placed in the kitchen sink, where they were reportedly soaking comfortably.